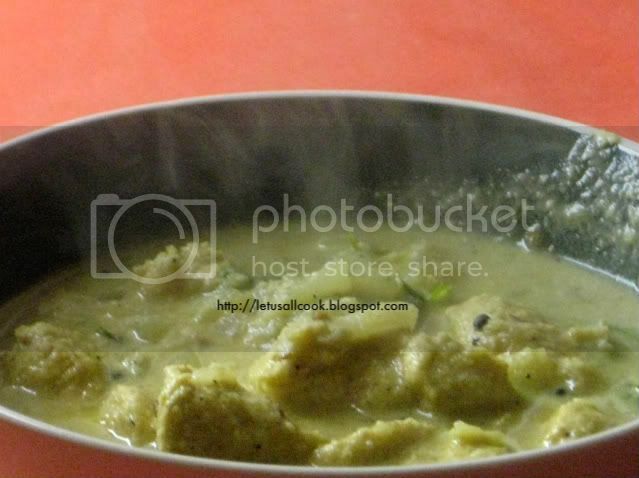 Whenever I hear Chicken Kurma, I automatically get reminded of the Sunday breakfasts at my in law's. My mom-in-law, most of the time, makes Chicken Kurma for Idly/Dosa for breakfast and my husband and my bro-in-law will be literally into an eating competition. I used to wonder... was it because of my mom-in-law's chicken kurma or was it because they were hungry.Hmm..I bet it was because of the recipe. 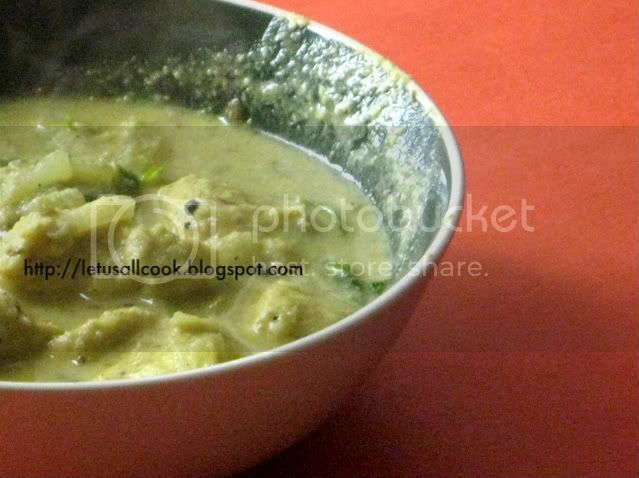 Recently my husband made the chicken kurma recipe and I went short of Idlys.! Huh..it means something...it means that the chicken kurma is utterly delicious. So here is the recipe for you to try and tell me what impact it had on your loved ones. In a pan, heat oil and add the whole garam masala. Add mustard seeds and when they pop, add cumin seeds and chopped onions. Saute them and add salt. In a blender, add cashews and coconut and make it a fine paste. When the onion is done, add turmeric powder and ginger garlic paste. Mix well. Add curry leaves and green chillies. Now add the coconut and cashew paste and mix well. Cook this mixture in a Sim flame till the oil oozes out. Now add yogurt, coriander and cumin powder. Mix well. Add chicken mix well. Add some pepper powder. Cover the mixture and cook it in a Sim flame. Occasionally stir. After 15 min to 20 min the chicken will be done. Garnish it with some coriander leaves and cook in Sim flame for 2 -3 min. This goes well with Chapati/Roti, Rice varieties, Idly/Dosa. I am telling you, your husband should start his own blog! he he he...I'll tell him! I'll show this to my dh to make! right now its raining here, and is really cold. and that bowl of hot chicken korma just made my stomach growl with hunger. yummy. Wow!This recipe came out very well! Thank you posting. This is so tempting....I'm going to try his for sure.